28 November 2015 We competed in the Wessex contest in Bournemouth on Saturday, giving a good performance of The Graces of Love, by Oliver Waespi. The adjudicator's comments were really positive and we were pleased with our overall placing of 8th out of 19 bands, especially as we beat bands from the Championship Section and First Section! Now for a month of carolling before we start work on our regional test piece next year. 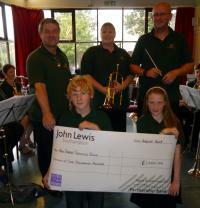 17 August 2015 Thank you to John Lewis Partnership who have awarded us a £1000 community grant to support our training band. This will help us continue to offer anyone in the local community the chance to learn an instrument and enjoy making music with friends. We will use the money to replace our music stands, which are on their last legs. We are proud and very grateful to have been chosen from among many applicants for this grant. Thank you John Lewis! 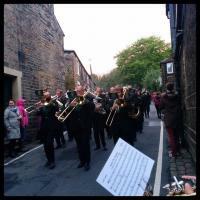 29 May 2015 For the first time ever, NFB made the long trek north to compete in the Whit Friday marches in Saddleworth, near Manchester. It was an amazing experience to take part in such a traditional event, as we joined 125 other bands, including top class bands like Black Dyke and Brighouse and some entertaining scratch bands. 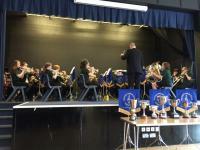 The atmosphere was fantastic and we played to some large crowds who were very supportive. Our results got better through the night as we were placed 52nd at Scouthead, 48th at Denshaw, 41st at Delph and 31st at both Dobcross and Diggle. Thanks to everyone who helped make it so much fun! 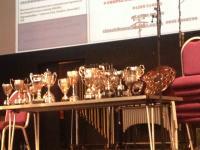 25 April 2015 We held an enjoyable Spring Concert at Waterside Theatre on Saturday featuring both the senior and training bands. For the first time in many years, the Michael Swatman Shield for most improved young player was awarded, to Hannah Gordon for her excellent progress on trombone. 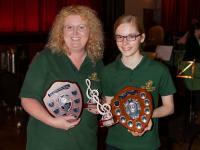 Also, the inaugural Trevor Jones Award for most improved adult player was presented to tenor horn player Paula Warren. Well done Hannah and Paula, who are just two of many who are coming on in leaps and bounds in the training band! The concert also featured the most entertaining raffle draw announcement in living memory! 14 March 2015 On Saturday NFB competed as a Second Section band for the first time this century (this millennium? ), in our annual trip to Torquay for the West of England championships. We enjoyed rehearsing the test piece, Variations on Macabbeus by Kevin Norbury, which was quite a challenge. We were happy with our performance, which earnt us 10th place out of 15 bands - not bad considering only 3 years ago we finished 10th in the Fourth Section! we went for steak on Friday night and curry on Saturday, so an enjoyable weekend. Thanks to everyone who took part! 31 January 2015 Well done to New Forest Training Band, who entered their first ever contest today, performing a 20 minute set in the Training Band section of the Wessex Youth and Training Band contest at Downton. The programme included Slaidburn, Skimbleshanks and the Great Escape. Chris was very happy with how everyone played. We were awarded 5th place and a bronze award by the adjudicator, who also made some nice comments in the written remarks. Afterwards we went for curry in Ashurst. Thanks to everyone involved for all their hard work and enthusiasm! Switch to mobile site Switch to desktop site Contact us! Email newforestbrass@gmail.com, or follow us on Facebook or Twitter!